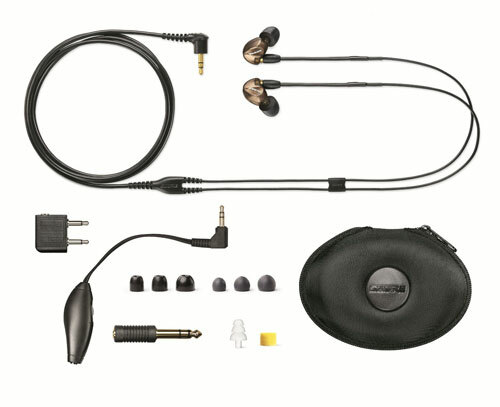 Shure is all about refinement, and the Shure SE535 is said to take all the features that make the SE530, a darling in the earphones market, to the next level. Priced at $549, it’s definitely in the upper rungs of the market – and Shure’s most expensive earphones to date – but funnily enough, it’s difficult to find critics putting out a bad word on it. How justified are all those glowing reviews? Analyzing the Shure SE535 is like revisiting other Shure earphones; there are no significant differences between it and the others. That is in no way a bad thing, seeing as the intuitive design provides an unmatched fit. The ear pieces sit just inside the outer ear and rest relatively flat. So when you lie down on your side, it doesn’t feel as if they’re drilling into your ears. Apart from the usual clear option (which looks ultra-cool), it’s also available in metallic bronze. The wide array of ear sleeves promises a comfortable fit but requires investing a little effort to find the right pair. There are three each of sizes S, M and L for both hard foam and silicone, and a pair in yellow soft foam and triple-flange tip respectively. The hard foam scores the most points for fit and seal, but don’t be put off by the triple-flange’s funny shape. If any of these don’t work for you, you can order custom-made ones from Sensaphonics or purchase from Comply. Once you’ve found your pair, the over-the-ear configuration needs a little attention as well. The thick, Kevlar-reinforced cable may look difficult to manipulate, but a few inches of memory wire near the ear pieces have been employed to make shaping it easier. Besides that, the Y-junction and L-plug are extra rugged, leaving you with the overall impression that the cable is positively built to last. There are certain things that the SE535 have over its little brother SE425; an airline adapter and a volume control remote. Other than that, the usual suspects accompany the SE535 in its box, like an earwax cleaning tool, a zippered hard case, and the aforementioned sleeves. The case is missing the convenient spool seen in the previous Shure cases, but considering the thickness of the SE535’s cable, winding it around like that may do it no favors. 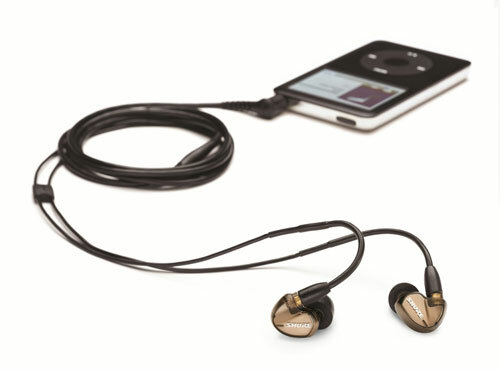 There aren’t many earphones with detachable cables in the market, and Shure is shrewd to carve a niche for itself here. Nothing is more horrible than having to replace an entire set of earphones just because the cable has gone bad. Besides that, the cable is attached to the ear pieces via two gold-plated MMCX connectors. This allows the ear pieces to have the added feature of being rotatable up to 360 degrees, which means that you can get a comfortable fit without tangling the cable. It’s wonderful to have a volume control remote included in the set, but wouldn’t a microphone complete the picture? Nonetheless, the remote works fine and has upped the convenience level. You can still purchase a CBL-M+-K cable for music control and microphone from Amazon (for about $45 – $50) if you’re not satisfied, though. Unfortunately, the quality is a bit of a let-down. The audio is the star of the show. After the perfect seal has been achieved, magic commences. It may be hard to discern where the SE535 is better than SE530 – they’re both using the same triple-driver technology after all – but the improvement is there nonetheless. The treble extends much further in SE535 and the overall sound more neutral. Whilst SE530 delivers deep bass, the solid and tight response of SE535 makes bass-heavy tracks sound more electrifying. The mid-range performance leaves nothing to be desired as well. You’d be immersed in a heavenly bath of vocals and instruments, all sounding separate and clear. The increased clarity and transparency also permits low-volume listening for extended periods – the earphones will churn out music long after you thought your ears would have given up. Even at high volumes, unwanted distortion does not make its way into the tracks. The reproduction is so precise that if you’re using lossy formats, the imperfections are definitely noticeable. Cranking the music way up high is out of the question, so your favorite tracks need to be high-quality for you to be able to enjoy them to the fullest. You will also notice that the instrumental sounds are beautifully placed at a distance from your ears, instead of coming from inside your head. The airy feel is just magical – there’s nothing else like it. Coupled with the fact that the noise-isolation capability is better than most headphones out there, what you get is a fortress of solitude. Nothing exists but you and your music. It’s so good that wearing these earphones while jogging is not recommended, lest honks and other important audio cues are blocked out. The soft foam tips may come in handy in this situation; they fit nicely but still let in some degree of outside noise. A pair of earphones needs to be spectacular before it can relieve you of half a grand, and the Shure SE535 is nothing short of spectacular. At $499, it’s beyond most budgets, but is an investment that is worth saving up for. The sturdy and detachable cable, ergonomic fit, and aural perfection are convincing points, and the noise-isolation feature (plus the airline adapter) makes this a possible air travel companion. If you have the money, buy it.